People around the world today or often very afraid that their lives, apartments homes and houses are being daily haunted by real ghosts, From public buildings such as hotels, museums and all locations in between where once tragic events in the past have forever tainted the stigmatized property. Many people investigate ghosts or paranormal activity and claim to understand the paranormal think that most ghosts are harmless, though by what many haunted individuals sate this is not the norm. And as what I can attest from personal experiences one should always consider employing a variety of methods if you are trying to get rid of unwanted ghosts in your living space. There are also those that have had ghosts unexplainably move into their lives out of the blue. And try as they might they try many different cures and rituals to run the ghost out of their lives. But often to no avail. I have even heard of people shedding their own drops of blood to form a pact or chanting weird occult ancient mantras and prayers to the spirits who haunt them to get them to leave. In the list below the order of how they are listed presents the best top ten method to rid ghost of any location, person or thing. Many times experts it seems suggest that you try things to settle the haunting problem before calling in a professional. Though to some doing things on their own usually makes the haunting worse. Renovations or new items brought into a home might be at the root of a haunting and the removal of this new item might just stop a ahuning dead in it's tracks. Many people shop second hand stores or buy items from others that might have a ghost attached and they do not know it. Many who have had ghosts banished from their lives will tell you that not all tried and true methods work well for some. And it might be to just your personal benefit to try each in this specific consecutive order until you are no longer being spooked or seriously haunted by the dead. Today their are many people who call themselves professional ghost busters. whether they really know what they are doing or not is usually proven by the results of their actual works and personal talents. and of course before you do anything else that might put you are your family at risk, you must make sure that the presence you have in your home is really a ghost and not something demonic. 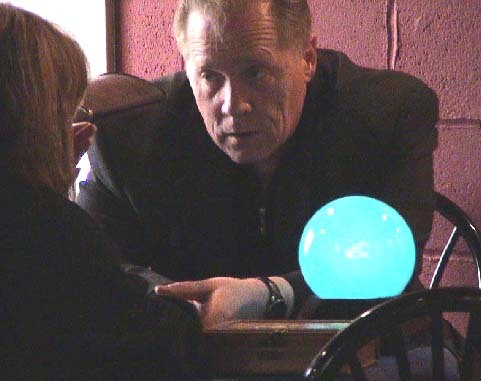 There are of course many self described psychics, mediums, spirit channelers and even so called self procalimed witches that often state they have the abilities to rid ones life of a true haunting. And many paranormal groups often employ these special persons for their services to rid haunted or paranormal active dangerous locations of serious destructive ghosts that may be keeping a family or individual on edge. Hire a professional shaman or spirit worker if you feel overwhelmed while trying to get rid of unwanted ghosts. Shamans specialize in spirit work and are knowledgeable about many spells to get rid of unwanted spirits and ghosts. Also you might ask your local priest or minister to assess the situation. It is their clerical duty, and they will be always happy to assist you in discovering what is afoot. And of course be extra wary always of anyone who openly claims to be an "expert" in haunted house cleansing or actual ghost removal and wishes to charge you a large fee for their special house ghost removal services. Call in a real Clergy person no matter what your religious beliefs are. Prayer groups work well also as does joining a religious group or as they say finding God for yourself. The Catholic religion will bless a home or property to repel ghosts, demons or unseen evil forces and it is also effective in such as the evil eye, curses and hexes. Many voodooist know of special tried and true passed down through generations ghost removing methods. Sometimes they consist of chasing a ghost from your home by bringing in spirits and ghost of their own that they control. Or the actual practice of capturing ghosts in bottles, jars and boxes often will do the trick. Their methods may seem very over the top to some but they have proven to be more effective in several unbelievable documented cases around the world. This as many know is a spirit or demon banishing ritual, But as many attest it works on ridding a persons life of real ghosts just as well. But of course the use of a profession clergyman is a must. Many often say come to terms with the dead treat them as if they were or, are alive. Ask the ghosts to leave nicely as if you would a late or overstayed guests. Directly address the ghosts as if you are speaking to a real living person in your home and ask them to leave in a calm but forceful tone. Many people sometimes open the front door and actually feel as if they are escorting the ghost out of the door personally. As an alternative, you can ask the ghost not to bother you: you don’t mind if it shares your space, but you do not wish to be disturbed. If the ghost then refuses then of course you need to use more drastic measures. Historically, feng shui was widely used to orient buildings—often spiritually significant structures such as tombs, but also dwellings and other structures—in an auspicious manner. Depending on the particular style of feng shui being used, an auspicious site could be determined by reference to local features such as bodies of water, stars, or a compass. The Chinese burn orange peels to get rid of bad ghosts and spirits in houses. With ghosts, Many swear that it's best to consult a feng shui expert for serious experienced help. The Chinese "art of placement" concerns changing the physical environment to minimize negative energies and maximize positive ones. Shapes, colors, textures, mirrors, fountains and crystals are common tools to alter energetic space. Invoking spiritual many say is divine help. Pray and call upon the intercession of God or sacred figures such as angels and saints. Take a lighted white candle and go from room to room and pray aloud. . Tell all unwanted presences to leave immediately invoking the name of God or Jesus. Seal each room by visualizing white light around it. Give a verbal blessing of protection, asking that only the invited may enter. Rid this my house this humble home of the uninvited ghosts that haunt it. Please remove and chase from my life these invisible supernatural unseen forces that plague me and my family. Many who pray to rid their lives of ghosts, haunting's and demons will state that when they would pray aloud as a family at night before bed, the ghosts would not haunt them. On nights they forgot to pray or a family member was left out or went to bed without praying, they might have another paranormal attack that kept the whole family awake until they prayed aloud together. All good Catholics use holy water all the time for a multiple of reasons and they do know how to use it to get rid of evil spirits and ghosts. Often many who are plagued by ghosts haunting their homes will bless their homes inside and out and even keep a small bowl of Holy Water near the front door so that guest can bless themselves as they enter their humble homes to keep evil spirits at bay. If you are not a Catholic or you do not have holy water, just go to a church and bring a container in which you can put holy water sprinkle the holy water around your home, focusing more on the areas in which you feel the presence of the ghost. Convex mirrors and even large dorm DOOR room mirrors attached to the front and not the back of a door are known to trap ghosts are cause them to flee. Many people might put a hand held mirror next to the bed and flash it in a ghosts direction to send them running if the ghost disturbs them in the night. Many mirror cures exist such as hanging a small double sided mirror or mirrored ball over ones bed. Small mirrored christmas ornaments or large disco balls will also do the trick. Smudge your home with sage. To smudge your home, open all of the windows in your home and light a bundle of dried sage. Sage is thought to clear away negative energy and spirits. Catch the ashes with a plate held underneath the bundle and walk around your home to cleanse it with the sage smoke. It may seem odd, but many people use garlic to get rid of ghosts. Garlic has long been used to drive away all types of unwanted spirits. Just hang a clove of garlic along hallways, in every room, by the windows, and by the doors. It may also help if you carry a piece of garlic in your pocket for extra protection. Many paranormal investigators still believe that if yo let a real haunting run it's course or you ignore it in due time the haunting will end as the ghost see's they and thier supernatural actions have no effect on you. There is also a obscure belief that ghosts do not like the bright color red. It is a belief that some ghosts are scared of that color and will go away. Rooms where ghosts are felt should have the doors painted red so that they cannot enter. Some people place a red handkerchief beside them while they work or sleep to prevent being disturbed or frightened by those paranormal beings. Do you know that many ghost Hunters and Paranormal community leaders do not know how to clean out a home of real malevolent spirits. They do know how to investigate them, and how to document a case and tell the client ok good-bye and good luck. But if your life and family are haunted what other resources do you have to get your house un-haunted? Most of them will tell you say a prayer. Or get the house blessed or smudged. My favorite thing I have heard is... "By the way I know somebody who will cleanse your hone for $200 ." "But there are no real guarantee's!" There are some that say that it is impossible to get rid of a ghost. Lean the tricks of the trade from the experts at Gold Rush Ghosts and Investigating the Unknown television show. Author Nancy Bradley and the GRG/ITU crew have included some of their favorite cases for you to read about. Krewe of Mid City Parade on the traditional St. Charles Ave parade route.